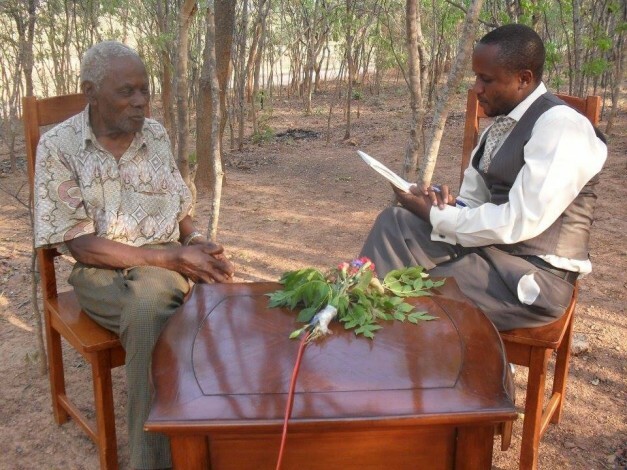 Elias Chipimo Sr, the father to NAREP president Elias Chipimo Jr in an interview with Owen Miyanza during the recording of The Archives TV Programe in New Kasama. Veteran politician, banker Elias Chipimo Senior has died, his son Elias Chipimo Junior confirmed Sunday morning, January 18, 2015. Chipimo Junior who is the president of NAREP said his father died at 08:00 hours this morning. “It is with a deep and profound sense of regret that I announce the death of my father, Mr. Elias Chipimo Senior. Dad died just after 8:00hrs this morning surrounded by five of his seven children,” Chipimo Jr announced. Chipimo Senior had been hospitalised in South Africa. Chipimo Jr. said his father has died knowing that he is dearly loved and will always be cherished for being the best father his children could have wished for. “I want to thank everyone that stood in support in good wishes and prayer during this very difficult time for our family. May God bless you all abundantly and may you continue to pray for and with us as we mourn and prepare to lay our father to rest,” said Chipimo Jr.
Last week Chipimo Jr announced that he was withdrawing from the presidential campaign to go and nurse his father who had been hospitalised in South Africa. Elias Chipimo Senior served as Diplomat during Kenneth Kaunda regime. In 1990, he became part of the team that pushed for the re-introduction of multi-party. He became Minister of Lusaka province after the MMD won elections in 1991. Condolescence to the Chipimo family. Deepest condolences to the Chipimos. Our condolences. Chipimo Sr represents an age of selfless zam Zambians. The news of the passing on of our parent, Mr. Elias Chipimo Sr has spread a sorrowful cloud across our nation Zambia. More so since even your political stance is about love—pamutima. May the Lord strengthen you and all the members of the Chipimo family during this trying moments. Zambia’s heart is with you. You ran your race, CHIPIMO SNR, and a RESPECTED ONE TOO – Go well. We know we will meet on the other side. My sincere condolences to the Chipimo famaly. Mr Elias Chipimo SR, was a true Zambian son with a passion for a better future for all Zambians.